Since the Los Angeles Lakers signed Tyson Chandler on Nov. 6, they are 12th in the NBA in opponent points per game (107.7) and 13th in opponent points in the paint (47.2). This was a vast improvement on their defense in the first 10 games before he arrived, ranking 28th in points allowed (120.0) and dead last in opponent points in the paint (59.0) with only JaVale McGee being a true center. Chandler alone hasn’t made the difference, but he does give head coach Luke Waltonan option to have a rim protector on the floor at all times when JaVale McGee goes to the bench. McGee is fourth in the NBA in blocks at 2.6 per game and owns a solid defensive rating at 104.6. Chandler leads the Lakers in defensive rating among rotation players at 99.4. Before Chandler signed, the Lakers could on rely on McGee to protect the paint and make up for any mistakes made on the perimeter. Chandler provided insurance for McGee, who is playing the most minutes per game in his career since the 2011-12 regular season. These two together are vital for the purple and gold’s defensive turnaround, and that was vital in their last two games. 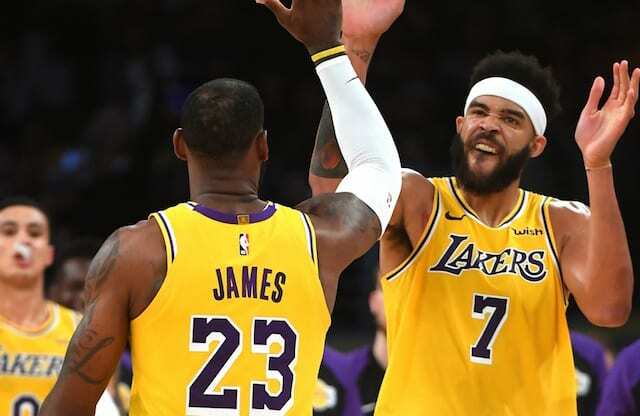 JaVale McGee missed the last two games of a four-game road trip with flu-like symptoms and the Lakers dropped both games, allowing 128 points (Washington Wizards) and 115 points (Brooklyn Nets) to a pair of Eastern Conference teams currently out of the playoffs. McGee’s absence isn’t the sole reason for the loss, but speaks to why this team needs both rim protectors healthy and playing. The Lakers surrendered 59.0 points in the paint on average in those two losses. Chandler was inserted into the starting lineup with his minutes staying roughly the same and Moritz Wagner and Ivica Zubac playing spot minutes. Kyle Kuzma was tasked with playing small-ball 5 again as the terrible experiment from the early portion of the season was back in action. Wagner and Kuz heighten the spacing and shooting on offense, but their lack of interior defensive skills and instincts offsets their offensive abilities. Chandler himself wasn’t impressive, ranking dead last in defensive rating with a 128.2. Instead of holding the paint down against bench bigs for the most part, he was against starting 5s and his age showed at times with former Laker Thomas Bryant outplaying him in the Wizards loss. The road trip was ugly in general, going 1-3 with their lone win coming against the Charlotte Hornets. They allowed 128 points in their other loss to the Houston Rockets in a game James Harden took over like he has done as of late. JaVale McGee is still feeling ill and is listed as questionable for the Lake Show’s Dec. 21 game against the New Orleans Pelicans. No McGee would be the worst possible scenario against the Pels with Anthony Davis and Julius Randle posing a tough matchup for the Chandler and the Lakers’ frontcourt (if Randle plays through an ankle injury). It’s a small sample, but the Lakers’ numbers statistically have reverted back to their first 10 games with JaVale McGee out of the lineup. It’s clear they need both of their rim protectors to be healthy and in the rotation to anchor the defense. This allows Lonzo Ball, Josh Hart and the rest of the perimeter defenders to be aggressive knowing they have some support behind them.